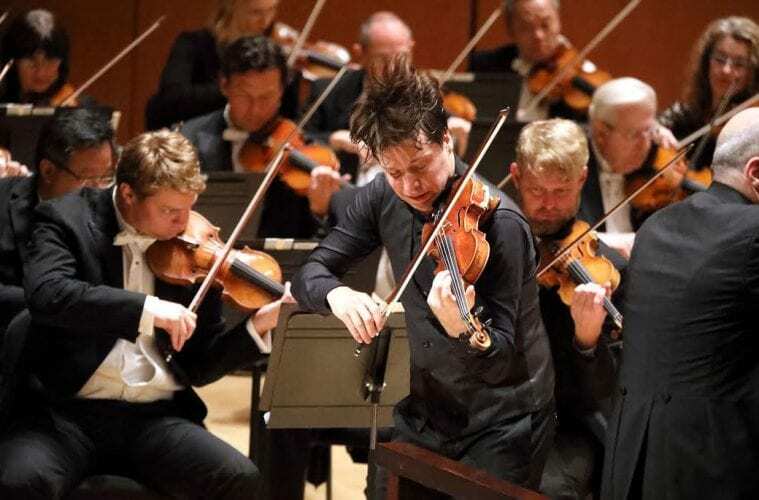 On Thursday evening the Atlanta Symphony Orchestra, under the baton of music director Robert Spano, performed a one-night-only all-Tchaikovsky special with superstar violinist Joshua Bell as featured guest artist. The concert drew a full house to Atlanta Symphony Hall. Spano and the ASO opened with the Orchestral Suite No. 1 from Pyotr Tchaikovsky’s popular ballet, The Nutcracker. As the setting of the ballet is Christmastime in Germany, The Nutcracker and its music have come to be relegated to holiday season performances, for better or worse, in the mindset of programming and popular culture. Thus, the Suite can seem a bit of a lightweight opener for a non-holiday concert. The opening Ouverture miniature, is spirited but deliberately scored for airy lightness, using only a portion of the orchestra that’s onstage: pairs of woodwinds and horns plus piccolo, triangle, and the upper strings. Rather than start with a bang, the orchestra snuck in quietly and nimbly with its opening music. In the Suite’s second section, Dances characteristics, came six brief episodes filled with the ballet’s familiar, often winsome, tunes. Spano held the reins in on the pace of faster ones, which limited the music’s sparkle somewhat but did achieve a little more studied elegance versus haste. The most forceful dance in the group was the Russian Trépak, which vies for the status of most popular dance of the ballet with the more frequently performed Danse de la Fée-Dragée (“Dance of the Sugar Plum Fairy”) and Valse des Fleurs (“Waltz of the Flowers”). The latter of those formed the Suite’s third section, and Spano gave it a more viable sense of forward motion to conclude the Suite with an ebullient end. 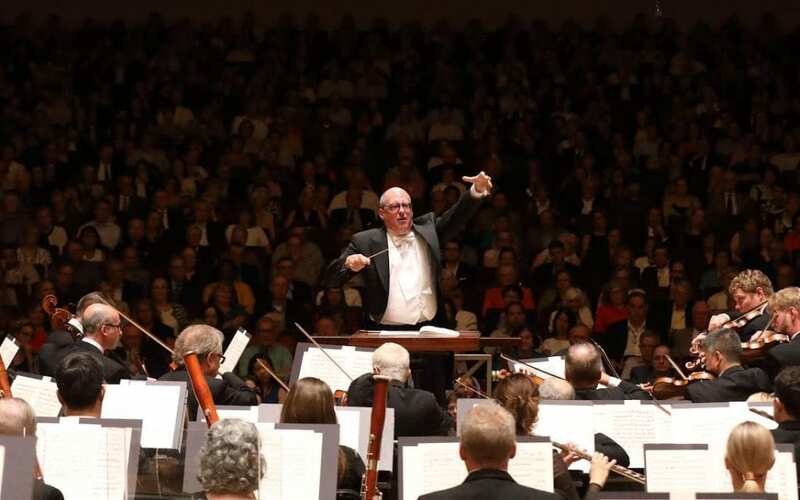 Spano led the orchestra before a full house at Symphony Hall. Of meatier musical substance was Tchaikovsky’s overture-fantasia Romeo and Juliet. An extended slow introduction, portraying the benevolent Friar Laurence, suddenly gives way to music of strife between the Montagues and Capulets. Most memorable, however, is the swooping and oft-repeated love theme, with its passionate, arching phrases. The themes ultimately resolve, with a final reference to the love theme introducing a climactic roll in the timpani and loud outcry of B-major chords from the orchestra before closing with a powerful tutti B-natural in the the final bar. Bell, wielding his legendary “ex Gibson-Huberman” Stradivarius, drew forth a passionately electric rendering of the concerto, poised in a tightly-wound stance as if he would leap into the air at any moment, often turning and leaning toward Spano’s podium in the heat of playing. The audience burst into applause at the end of the first movement. They had no chance to do so after the beautiful but brief Canzonetta that serves as the second movement, as the music went directly into the dazzling finale without pause. Bell brought forth all of the movement’s impetuous brilliance, climaxing in the riveting final moments. 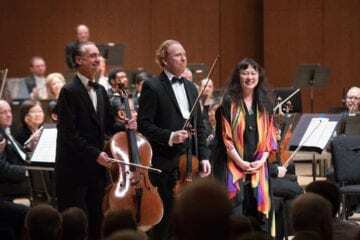 He returned to the stage for an atypical encore with the ASO and Spano: the title theme from Nigel Hess’ film score for Ladies in Lavender, a 2004 British drama written and directed by Charles Dance, based on a short story by William J. Locke. The story involves a pair of sisters who rescue a talented Polish violinist who, en route to America, is swept overboard and is washed ashore on the beach below their house in Cornwall. Bell recorded all of the solo violin music for the soundtrack, which includes compositions by Mendelssohn, Paganini, Debussy, Bach and other classical composers in addition to original music by Hess, backed by the Royal Philharmonic Orchestra (RPO) of London. The soundtrack was released by Sony just days before the film made its U.K. debut in 2004. The U.S. release came the following year to coincide with the film’s American debut. 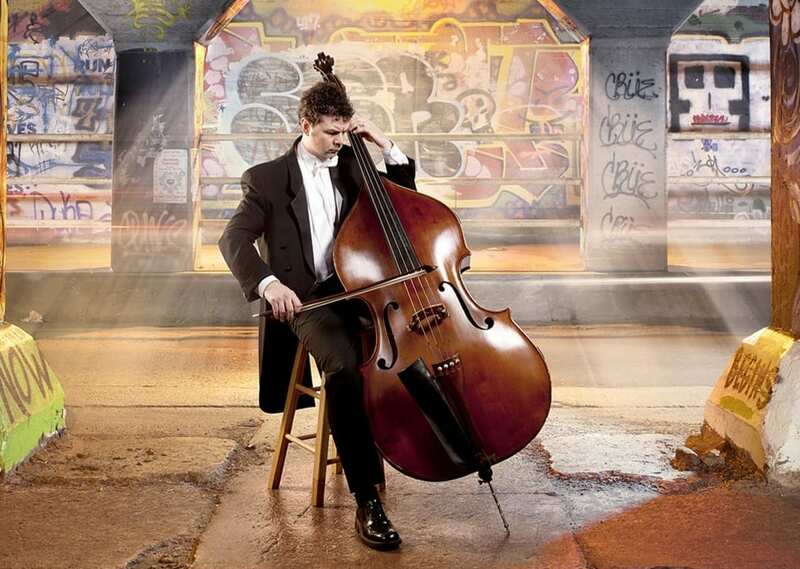 Hess’ title music is unabashedly melodic and sentimental throughout its four-minute duration, a sweetly unimposing piece which nicely capped the evening. Afterward, Bell autographed CDs in the galleria, then prepared to dash up to Buffalo, New York, where he performed Max Bruch’s Violin Concerto with the Buffalo Philharmonic on Saturday in another one-night special at Kleinhans Music Hall.